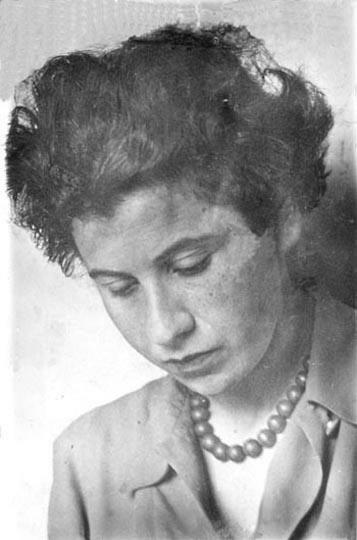 Photograph of Etty Hillesum from the Jewish History Museum of Amsterdam. I also think the figure of Etty Hillesum, a young Dutch woman of Jewish origin who died in Auschwitz. Initially far from God, she found Him looking deep inside herself and wrote: "There is a well very deep inside of me. And God is in that well. Sometimes I can reach Him, more often He is covered by stone and sand: then God is buried. We must dig Him up again "(Diary, 97). In her scattered and restless life, she finds God in the middle of the great tragedy of the twentieth century, the Shoah. This young fragile and dissatisfied woman, transfigured by faith, becomes a woman full of love and inner peace, able to say: "I live in constant intimacy with God." But who was Etty Hillesum? And what did the Pope mean when he called her "far from God"? Susan Stein is a writer and performer who is bringing Hillesum to life in a one-woman play called Etty. The play is adapted from Hillesum's own diaries and letters. She begins the diaries when she was 27. Hillesum is a Slavic languages student in Amsterdam. She had previously studied law in hope of becoming a judge. Onstage, Stein portrays Hillesum's struggles with depression and suicidal tendencies, her self-induced abortion, her decision to forego marriage and children. The diaries also chronicle Hillesum's complex and ongoing relationship with spirituality and identity. Under Nazi occupation, her spiritual life flourishes. "She is studying the Quran. She has the New and Old Testament with her. She quotes Matthew a lot. She keeps Saint Augustine under her pillow. She brings the Quran with her to Auschwitz. She practiced Buddhism. But she does identify herself as a Jew," Stein told Frank Stasio in an interview on The State of Things. Hillesum's nuanced beliefs lead to sympathy for her persecutors. "She says, 'If an SS man were to kick me to death, I shall never the less look into his face and think, My God, you poor fellow. What terrible things must have happened in your life to bring you to this pass?'" Stein said. Etty Hillesum died at the hands of the SS. Her life ends in Auschwitz in 1943, when she was 29-years-old. The play Etty is touring schools, theaters, Jewish community centers and prisons. Last November, Stein performed at Massachusetts Correctional Institution - Framingham, the largest women's prison in the United States. Susan Stein as Etty Hillesum. As I was walking through the different buildings and courtyards, I was aware that some of the women will die there. And I understood that Etty also understands that she will most likely die," Stein said. "And the inmates understand, even though they're very clear that their experience is very different from hers, that their thinking about mortality and freedom is different than mine."